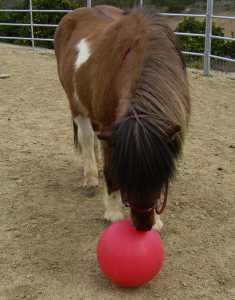 The other day I splurged on a beach ball from Wal Mart for the horses. Never did I have any idea how much fun it would be for them to target the beach ball nor how many training benefits would accrue. Since both my mares are used to working together, I introduced it to both of them at the same time. When they first saw it rolling, they both scattered, of course. Meadowlark was the first to return to investigate it and earn a click. Serena was soon right next to her. The first few times I lifted the ball up and rolled it away, they both acted a bit spooky. But, in no time at all I had two horses crowding around me before I could even get it out of my hands. Not wanting to get in the middle of two mares in excited competition, I quickly added another step into the training. Both mares were clicked for targeting the ball with their nose and then they had to back up two steps and stay there until I rolled the ball away. I would cue them to "touch" and off they would trot to the ball. Serena is usually taciturn and can be almost lethargic but she was trotting briskly after the ball. Meadowlark is Appendix Thoroughbred so she was off to the races in no time. My job was to stay safely aside until they had reached the target and touched it. I would click from a distance and then treat them as they stood quietly waiting for their reward. Now to the benefits. Both of my mares have been struggling with different body issues that requires me to restrict the amount of lunging they do. Circle work is restricted, especially smaller circles, so I have been scratching my head for a way to exercise them that wasn't exhausting for me and injurious to them. Meadowlark isn't being ridden currently and Serena's spinal cord injury/past problem still restricts her riding tolerance. She is only ridden for short times at the walk. I have discovered that working with the beach wall is a wonderful way to gently warm the horses up at the walk and then introduce slow trotting. They get exercise but without aggravating body issues that can be stirred up by too many circles. They also get lots of transitions. Since they are accustomed to working politely together, I can exercise them both at the same time when I am short on time and energy. Meadowlark is practicing her ability to be energetic yet stay calm and polite when targeting the ball. I have tried teaching her trotting in hand in the past but we haven't perfected that yet. She seemed to considered my running along side of her as a sign that the herd was in trouble and she needed to leave fast. If I insisted she slow down through the lead she would pin her ears and make unhappy faces at me for asking her to go forward and then immediately asking her to slow down. The beach ball gives a wonderful interim training step between her free lunging and trotting in hand. Tonight she was trotting out but also staying aware of my position and remaining polite throughout. Since she was heading to the target off lead, I could allow her to get a bit ahead and not have to ask her to slow down. Some of the time we practice walking to the ball together as well. Towards the end we were getting a steadier trot in which I could keep up but she didn't feel crowded and pressured. I was delighted to discover targeting the ball was an ideal training medium that can eventually lead to trotting in hand on a lead rope. For those people who are dealing with horses that are so used to staying glued to their side that they can't get them to "go forward" out ahead, targeting a ball will teach them that they can work out ahead of you or leave you and still earn a treat. I balance the ball work with leading exercises to ensure we maintain our past lessons about matching my pace when I request it. Meadowlark is improving each year but she has tended to be a reactive, sensitive mare. As a youngster she was spooky and would bolt without apparent warning, if something alarmed her. I was thrilled tonight when we took targeting the ball to a new level. By the end of the evening, I could stand next to her head, kick the ball into the air so it went at least 15 feet high and landed on the other side of the arena. I would then release Meadowlark and she would trot after the ball, trying to target it with her nose before it could even stop rolling. She didn't bat an eye when I kicked the ball vigorously throughout the arena and wasn't the least worried to see it flying through the air. A new version of sacking out to play with! I was so thrilled as tonight's exercise was something that would have sent her in full flight in the opposite direction not that long ago. I admit I have been slow to come to trick training and "horse toys" as there were so many "manners" and foundation behaviors that needed to be established first, especially with Meadowlark. And I think I was wise to get her emotionally stable and thoroughly familiar with the clicker game first so we can now play in a safe manner. I had to work a long time on teaching her patience, calmness and tolerance for standing still. Now we get to mix it up a bit with exuberance and energy. Now we are literally having a ball working a bit into the other end of the energy spectrum while maintaining manners and respect of space. Besides all these wonderful educational and exercise benefits, all three of us are having a lot of fun. 1) Introduce the ball. Have it sitting still and encourage the horse to approach it. Click if they reach forward to sniff it or touch it. Repeat as many times as necessary until the horse is clearly comfortable with touching the ball and understands that it will be clicked for touching the ball with its nose. 2) Roll the ball forward a few inches. My horses know what the word "touch" means. If I cue them to touch, they will look for the nearest object to touch with their nose. You don't have to introduce a verbal cue now or at all, as long as your horse clearly has the idea of moving towards the ball and touching it. 3) Gradually extend out the distance you roll the ball, making sure that the horse is highly successful at each step so it doesn't get confused or give up. The more time you spend on getting each component solid, the more reliable the final behavior of chasing the ball. 4) At least with my horses, once they knew they were to follow the ball or go to the ball, they rapidly became enthused about chasing it. We started with a very low level of energy and only accelerated the pace when they were clearly comfortable with the ball's motion and were eager to follow it. A lot will depend on your own horse's prior training experiences which is why I was pretty vague in specific details in my original post. My horses have already been trained to go forward to stationary targets without me so the only new element for them was the idea of going to a moving target. 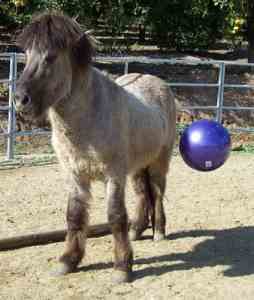 Also, you will need to see how skittish the horse is about the ball, especially the ball rolling. Some horses have been trained to stand still and ignore strange objects. In this case, you will need to increment the distance very slowly and encourage the horse to move forward to target the ball. 5) Get the behavior solid at a walk before working on speed. My horses were used to walking with me at liberty so initially I walked with them to the ball, after I rolled it. As they became more enthused they gradually went on ahead. I think when I started the horses trotting to the ball, I trotted with them so they knew they had permission to go faster. 6) If your horse is not used to working at liberty, you may want to start this on a lead rope. Safety always comes first. If you see your horse getting exuberant in a way that makes you feel uneasy, definitely do the initial training in hand and slow down the pace. If I saw any rudeness between my mares or towards me, I stopped the game and left the arena for a few minutes. I only had to leave once when Meadowlark tried to warn Serena off from the ball. Both horses have been well mannered since. You are the best judge of your horse and its level of training in this area. 7) The behavior of "step back and stay back until I roll the ball" became necessary once the horses were so eager to chase the ball that they weren't willing to wait for me to roll it. Essentially they were mugging the ball to earn a treat faster and so they were starting to crowd into my space. I immediately set up the rule of them staying back and rewarded it each time initially so they didn't feel teased or punished by my withholding the ball. In time, they learned to stay back without me physically walking them back. In order to ensure calm, control and safety, I simply took the horses by the halter, dropped the ball and backed them up a few steps. I clicked and treated for their backing. Once they know they will get reliably treated for backing as well as going forward and for staying back, they are happy to be polite. They are interested in getting the maximum number of treats in the shortest possible time and they don't particularly care what order they have to do things in, as long as requests are consistent and predictable. Please note that my horses were trained to back on cue, to stand stay at liberty and to go forward or touch on cue. So I was simply shuffling several very well trained behaviors. Since they had a rich "vocabulary" of trained behaviors, it only took 3 sessions to achieve the final behavior. Establish the rules for safety first, before you introduce an activity in which the horse will work at liberty and especially before you work at liberty in high energy. It is a great joy when you get to that point! I hope all of my details and cautions are not daunting. Once you have an idea of what behavior you want to end up with, it is simply a matter of starting with the introduction of the ball and let the horse's response dictate what are the next essential steps. Let this be a fun and safe learning experience for you and the horse. Take as long as it takes at each step of the way and enjoy the journey. I hope you have a lot of fun with this. It is good exercise for the trainer too!